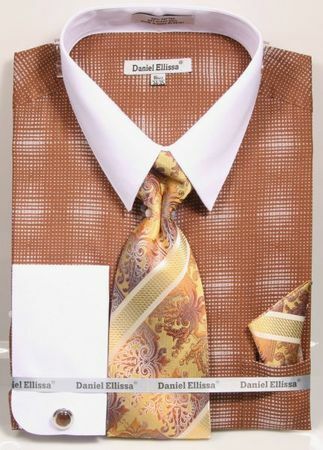 Give your style side a serious fashion boost when you wear fancy pattern dress shirt and tie sets with the Daniel Ellissa name. These shirt and tie sets are perfect to kick up your style a couple notches with their never boring styles of dress shirts. This brown dress shirt has a plaid pattern with a white collar and french cuffs. Matching tie set is included for the perfect look.